Just in case you missed it, it is summer. As a matter of fact, today, temperatures reached a record 30C. It is hot swelteringly hot. Now would be a good time to ensure you maintain your personal hygiene particularly in the parts of your anatomy that will inadvertently be in the general vicinity of my olfactory organs. At the first whiff of the rather unpleasant odour from your underarms as you leaned over to wash my hair, my nerve endings went into overdrive as they tried to unscramble the frantic message my brain was sending them. “Shut down olfaction with immediate effect,” it yelled to the already overworked nerves. The poor things had their work cut out for them trying to regulate my body temperature on such a hot day. So it took them slightly longer than normal to respond to this command. If I wanted to break the world record for holding my breath, I would have trained as a free-diver and perhaps made some money out of it. I have no wish to keel over and die prematurely with my head hanging over a sink and my hair dripping wet! Imagine what my epitaph would read? They might as well have been firearms. Thanking in you advance for your usual co-operation. P.S I must not fail to add that you did a cracking job on my hair. I have no complaints regarding that. Who needs enemies when you’ve got a blog? I’ve been meaning to update my blog but things keep coming up. I start a post and then leave it unfinished. Every time I log on, I can hear it prodding me to update it to make sure its contents are current and fresh. I told you in a previous post that I sometimes carry out conversations with inanimate objects. Click here if you have no clue what I’m on about. Anyway, here’s one such conversation that ensued between me and my blog. Blog: So when are you going to update me? Blog: Inko-what? What does that even mean? Me: Sigh! It means not fully formed or developed. Blog: Why didn’t you just say that then? Me: I did. It’s not my fault your vocabulary is so limited. Me: Oh please, don’t be so juvenile! Sigh! It’s just that I’m struggling to write anything that makes sense at the moment. Blog: Mschew! Like that has ever stopped you in the past! Me: I beg your pardon! What are you trying to say? Blog: I’m not trying to say anything. The archives speak for themselves. Me: Wow! Thanks for the vote of confidence. Blog: All I’m saying is you should stop making excuses and just get on with it. Me: I would get on with it if you would just stop with the nattering. Me: So, have you got any suggestions on stuff I could write about? Me: Hey, I’m talking to you! What’s the matter with you? Me: Did you hear me? I asked what you think I should write about. Blog: Hey, you don’t need to shout! I can hear you perfectly well. Me: Then why didn’t you say anything? Blog: Because you told me to shut up. Me: I didn’t tell you to sh…oh, I give up! Honestly! And so our argument dialogue goes on. Hopefully I will put a fully formed and developed blog post up shortly. My boys have a friend over today. It’s half-term and his parents are at work so I agreed to watch him today. My boys are besides themselves with joy. Time was, when they had a play date and I would be hoarse from shouting above the din just to be heard. By now, I would have settled a thousand squabbles, soothed many a perceived injury and wiped gazillions of tears. Today, they’ve been entertaining each other. As I write, they are watching TV, quietly, together. No arguments about what to watch. No disagreements about who sat where first. Bliss! I wish I could say today is a typical day but it’s not. It’s one of different kinds of days that we have. Some days it seems like they wake up with the sole purpose of making my life miserable. They moan and complain about everything from the clothes they have to wear to the food they are given to eat, their manners go AWOL and they make such unpleasant company. Nothing I do on a day like that is good enough. On days like that, I struggle to give thanks for them. I feel like running away from the responsibility of raising them. I’m tempted to hide under my duvet till the day passes. But I don’t. I remind myself that ‘this, too, shall pass.’ I dole out one disciplinary measure after another accompanied by the appropriate ultimatums. I steel myself against the whining and whinging and mutter “Lord, give me strength” under my breath. 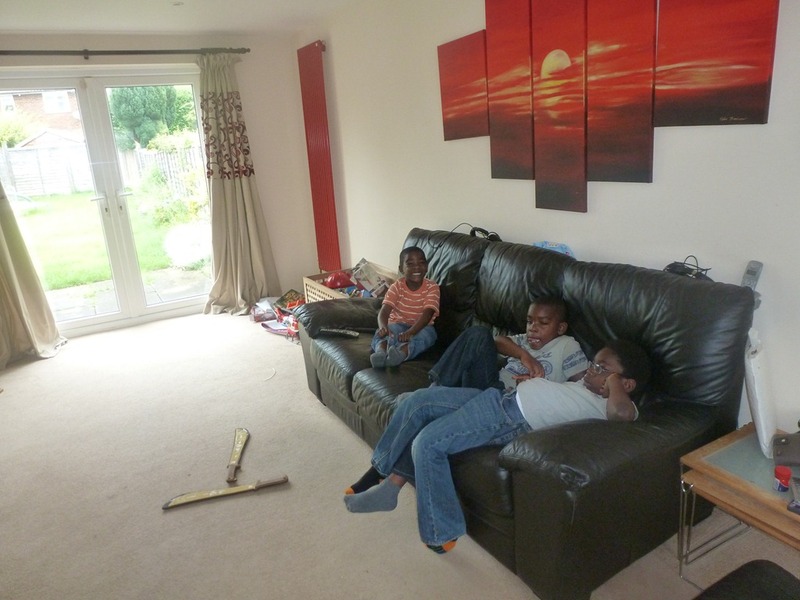 And when I finally put them to bed and they sleep off, I go downstairs, sit on my favourite end of the sofa, prop my feet up on a stool, exhale and thank God that we made it through the day with neither filicide nor matricide being committed! On other days, they have so much energy to burn, I get exhausted just watching them zip around the house. If the weather is agreeable on such days, I engage the services of my trusty friends, also known as bicycles, scooters, paddling pool, trampoline and best of all, playground/park. If it is one of the typical British days, when even the skies are sad and weepy, then I sometimes put on some music and do silly dancing with them, play games and/or put on a movie. When all else fails, I clock-watch and pray fervently for bedtime. 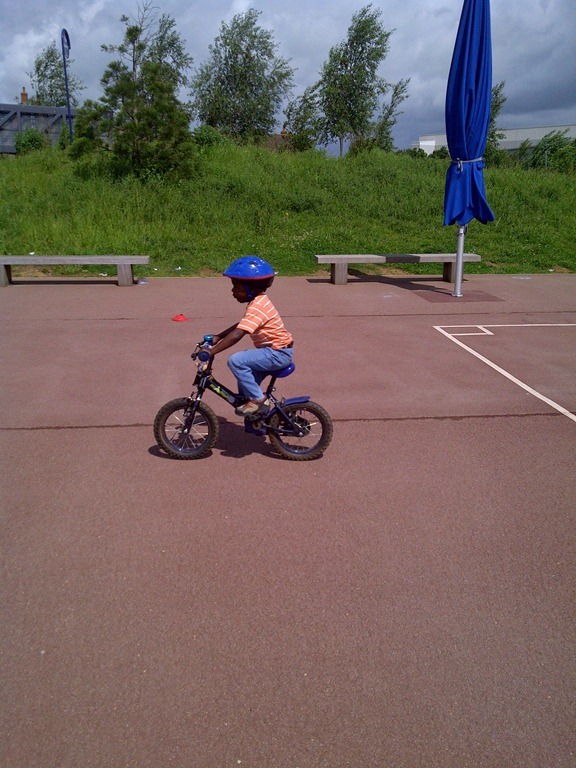 Yesterday, EDU, who turned 4 a few weeks ago, learnt to ride his bike without stabilisers. I’m so proud of him. His big brother, WEO, who will be 6 in just over two weeks, is getting so independent. He is learning to tell the time, can bathe and dress himself with little or no assistance. They are growing up so fast! I remember when they were totally dependent on me for everything. Now, they can do so much for themselves. Time goes by really quickly! It goes by in little and, subsequently, large increments starting with nano-seconds becoming seconds, then seconds turning into minutes. The minutes soon become hours which then burgeon into days, weeks, months, years making up the sum total of a lifetime. Tomorrow may be one of those days I dread but I won’t worry about that for “…sufficient unto the day is the trouble thereof.” Matthew 6:34.Today, I’m experiencing a breath-taking moment and I am thankful. What’s your day been like? On the 2nd of June, a Nigerian cargo aircraft overshot the runway in Accra, Ghana and ploughed into a bus killing 10. On the 3rd of June, a plane crashed into a residential area just miles away from the Lagos domestic airport killing all on board and some on ground. As news of their loved ones’ demise in these tragedies filter through, mourning relatives would have been fortunate if the news was confirmed through official channels. The passenger list was circulated and published all over social media, so they may very well have read the devastating news online. I’m still unsure which riles me more; the voyeuristic posting of photographs of the remains of the deceased by the Nigerian media, the unofficial publishing of the passenger manifest or the lackadaisical and nonchalant approach of the Nigerian government to air accidents. I’ll address each in turn. From what I gathered from people who live in Nigeria, only one local TV station interrupted their scheduled programmes to announce the news of the crash when it happened. It was from the foreign press, BBC and CNN etc. that most people got wind of the news. Then when the rest eventually cottoned on, the coverage was gruesome as though the news crews lacked the ability to filter what makes for decent reporting. Rumours of still burning bodies and the charred fuselage bombarding TV screens were rife. Sad! Twitter was a-buzz with links to the passenger list on various websites. Though I struggle to see how people can think the manifest of a fatal air crash is something to bandy around like a joke, I totally understand why they would do it. The authorities, whoever that elusive body might be, have failed us as a people. The failure of government to take control has created a vacuum and it is that which has now been filled by individuals acting as their own local government. As for the Nigerian government, what I have to say about them could fill several tomes but I will restrain myself. The aviation minister, Princess Stella Oduah, was reported to have said she was ‘saddened’ by the crash. ‘Saddened’? I can think of several adjectives the aviation minister could use to describe their feelings at this time but ‘saddened’ barely scratches the surface! What a joke! The Nigeria president, Goodluck E. Jonathan has declared a three-day mourning period and said the Nigerian flag will be flown at half-mast in that period. No disrespect, sir, but how does that help anyone? How about a root-and-branch sanitisation of our aviation industry? How about enforcing more stringent checks for air safety? How about thoroughly investigating accidents when they do happen and implementing measures to avoid repeat performances? How about prosecuting the guilty to serve as a deterrent?More stringent tests for aging aircraft? A three-strikes-and-you’re-out policy for failing and accident-prone aircraft? How about not turning a blind eye to the decrepit, cast-offs by way of aircraft which are allowed into our airspace when they’ve already been condemned in others’? I am particularly aggrieved by the passenger aircraft crash and the needless loss of lives. I appreciate that accidents happen and death is the inevitable end of us all. However, I am upset because this accident could have been prevented. It would appear the aircraft in the accident was brought out of retirement and sold to Dana Airlines in 2009. There are very few countries in the world where this aircraft would have been considered air-worthy. On May 3, an unnamed Lagos station manager of the airline was reported to have drawn the attention of management of the airlines that the aircraft in question needed to be grounded for general check-up but that alarm was ignored. So on May 11, 2012, the same aircraft that was billed for Lagos/Abuja with more than half capacity passengers [made an] emergency landing at the Murtala Muhammed airport. Reports said passengers on board had to hurriedly disembark and sought alternative means of travelling. No casualty. On May 25, 2012, the same plane that was to do Lagos/Calabar flight also made another air return to Lagos after the crew reported engine fault. There was also no casualty. Then came the final straw. On June 3, 2012, the same MD-83 with registration number 5N-RAM was performing a flight 9J-1993 from Lagos to Abuja with 153 passengers on board when the crew also discovered that the engine had developed fault. The pilot made a quick air return to Lagos. I am angry because though there has been a huge outcry in the immediate aftermath of the accident, the dust will soon settle and everything will be back to normal. All the grandiose promises by government to thoroughly investigate will join the sky-high heap of broken promises. Brown envelopes will exchange hands and all will be well again. That is, until the next plane crash. Then the ridiculous cycle will be replayed. In the 56 years of Nigeria’s aviation history, there have been at least 43 accidents involving Nigerian-operated aircrafts at home and abroad. Less than a quarter of these had any survivors. What lessons have we learned from the past? What measures have been put in place to prevent the same happening again and again? From where I’m standing, I would say we haven’t learnt a thing and unfortunately there will be more accidents like this in the future. I weep for those who died in the Lagos crash. As an air crash survivor myself, I know how their last moments would have played out if they were aware of the impending doom. Thoughts of loved ones they would never see again, children, spouses, parents awaiting them at what should have been their destination would have broken their hearts as they said their last prayers and hoped for a welcome on the other side of eternity. The claustrophobia of staring death in the face and not being able to escape, the gut-wrenching, heart-stopping fear, the wretched helplessness in the faces of the other passengers. The screaming as the plane literally dropped out of the sky and hurtled towards earth, the shouting, crying babies and children, the sheer chaos, the smell of burning, the loud bang on impact and the ensuing deafening silence! Heart-wrenching! It’s time our government and all the relevant aviation regulatory bodies take responsibility and ensure that air travel in Nigeria is safe for its citizens. This is the 21st century. It can no longer be business as usual.